The marriage-go-round can be a costly ride for children in post-industrial countries as family instability is associated with elevated risk of negative outcomes like teen pregnancy, depression, aggression, asthma, and obesity. But could union instability really make the difference between living and dying in contexts where basic health inputs like piped water and complete immunization are surely paramount? 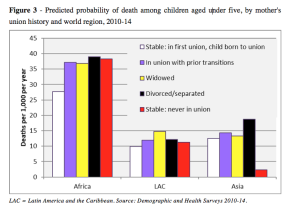 The sobering answer is yes: Even after accounting for maternal education and household wealth as well as various other predictors of childhood death, in the “Global South” (Africa, Asia, Latin America and the Caribbean) children of mothers with unstable union histories face higher risk of death (DeRose et al., 2017). In countries where most children of single mothers are economically disadvantaged relative to children in two-parent families, accounting for family socioeconomic status shrinks the estimated cost of being reared by a lone mother. That is, children of lone mothers would have worse health outcomes even if their mothers were partnered, so part of their disadvantage has nothing to do with maternal union status. But a little-known fact about mothers who have never been in a marital or cohabiting union in Africa, Latin America and the Caribbean, and Asia is that they have more education (Figure 1) and are less likely to be poor (Figure 2) than mothers whose children were born during their first and only union. 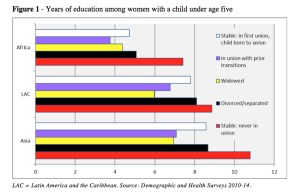 Why would advantaged women in the Global South be more likely to bear children before entering a union than their poorer and less educated counterparts? The simple answer is that socioeconomic development tends to increase the average age that first unions are formed. Where unions are formed close to puberty — in the least developed countries, 13 per cent of girls marry before age 15 (UNICEF 2017) — there is little opportunity to have a birth before first union. In contrast, there is much more opportunity where entry into unions has become delayed until the later teens, 20s, or even past 30. The oldest average marriage ages are in the world’s most developed countries, and many of the countries with the earliest average marriage ages cluster around the equator (United Nations 2015; see map here). It is also the case that more advantaged women are more likely to divorce in much of the Global South. Access to divorce can be limited by patriarchy, personal resources, and the strength of traditional norms: Educated women are more likely to overcome these obstacles. 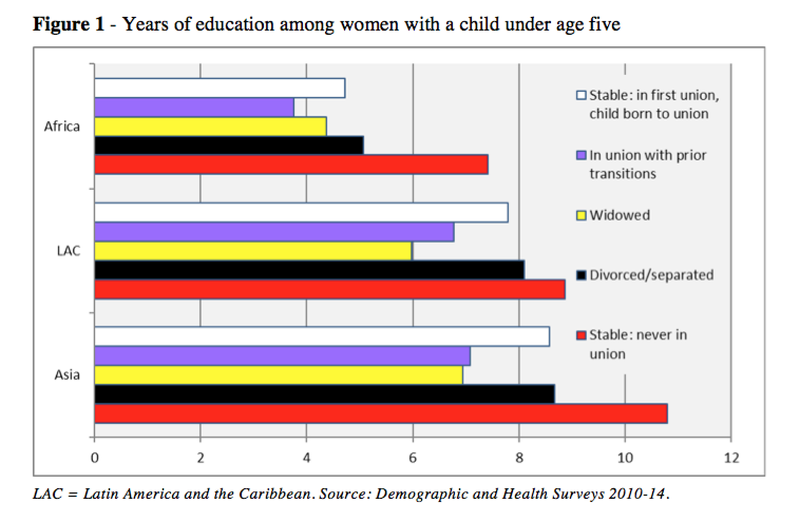 Overall, we did not find divorced mothers to be as consistently advantaged as mothers who had never been in union, but they still had more education in Africa and Latin America, plus they experienced lower rates of poverty in Latin America (Figure 2). 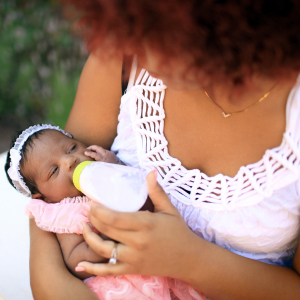 When single motherhood is concentrated among socioeconomically advantaged women, poor health outcomes among children of single mothers cannot be explained solely by socioeconomic disadvantage. 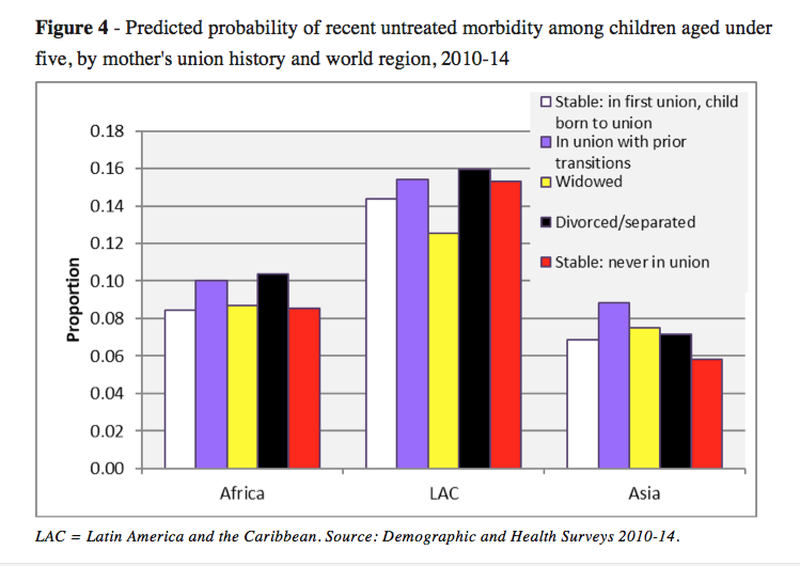 So far, I have highlighted how different Northern and Southern countries are with respect to who becomes a single mother, but our work also uncovered an important similarity across the globe: Poor health outcomes are more strongly associated with union transitions than with union status. 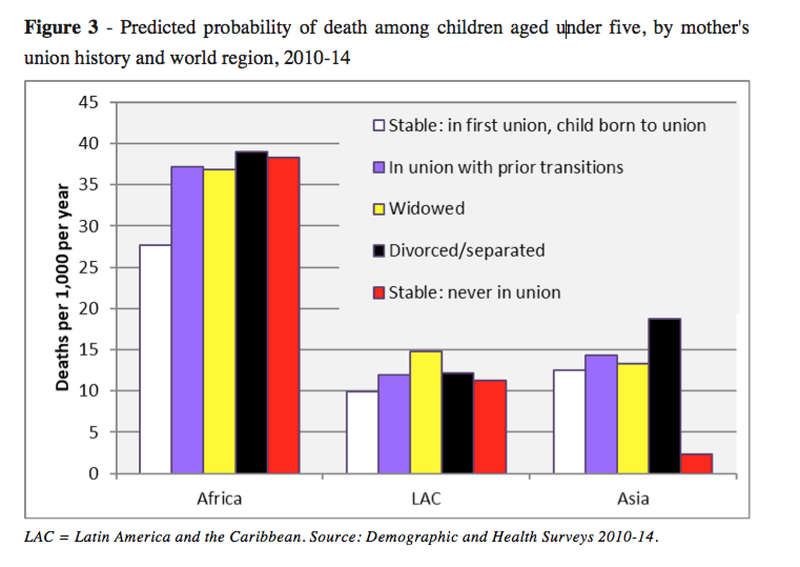 We found higher childhood death rates among children of divorced mothers in all three major regions of the Global South, but higher childhood death rates among never partnered mothers only in Africa (Figure 3). Moreover, children of currently partnered women had significantly lower risk of remaining untreated when suffering symptoms of one of the three leading causes of childhood death (acute lower respiratory infection, diarrhea, and malaria) in the developing world if their mother was in her first union than if she was in a subsequent one in all three regions (Figure 4). Together these findings show elevated mortality risk among children whose mothers have been through union transitions—regardless of union status. How can union transitions before a child was born matter? 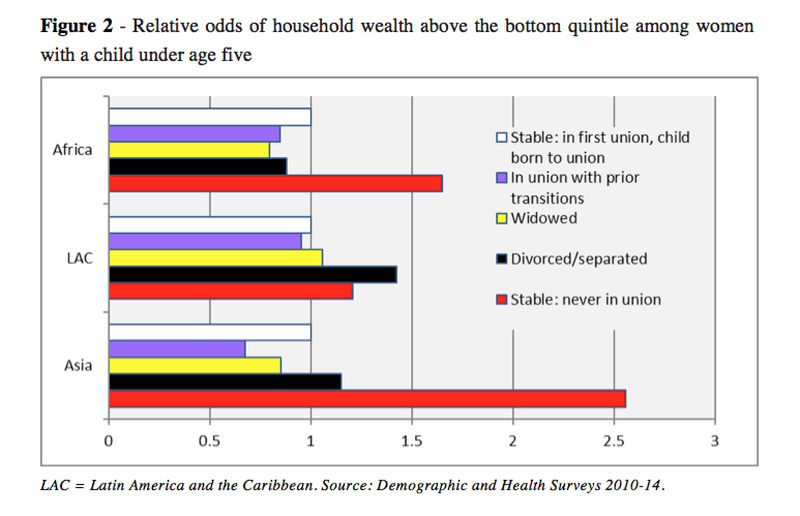 Our work found elevated mortality risk among children of mothers with unstable union histories. Our data came from a single point in time; in most cases, we did not know whether women had changed their union status during their child’s lifetime (or since their child’s lifetime ended). Many children of repartnered women were, however, known to be living with their biological fathers: These children were significantly more likely to suffer symptoms of one of the three leading causes of childhood death in the Global South (acute lower respiratory infection, diarrhea, and malaria) and remain untreated—even though they lived in two biological parent families. In other words, children’s higher mortality risk did not depend on whether maternal union transitions occurred during their own lifetimes. Why would a mother’s prior union transitions put a child at risk? Prior transitions may have compromised the mother’s physical and mental health, plus caregiving is more complicated in blended families. Also, given that more educated women in the Global South are more likely to be single parents, those who have repartnered may have been motivated in part by economic necessity (again see Figure 2). Therefore, our work did not establish that union transitions themselves decreased children’s survival. We nevertheless argue that maternal union instability is a marker for childhood mortality risk that warrants policy attention. Characteristics of previous partners that cause both union dissolution and childhood death (like being physically abusive) would not explain why rates of recent untreated illness are elevated among children of divorced and repartnered women, unless it were somehow a consequence of union transitions. Further, in cases where something about the mother is the common cause of both union transitions and child health outcomes (e.g., she is mentally ill, addicted, selfish, HIV-positive, or repeatedly chooses lousy partners), then she would carry those traits into subsequent unions, and her children would still require health interventions. Finally, the similar outcomes between children of divorced and repartnered women argue against poverty as a common cause of both union disruption and childhood mortality risk. Targeting children of mothers who have experienced union instability—regardless of current union status—may augment ongoing efforts to reduce childhood mortality in the Global South, especially in Africa and Latin America where union transitions are common. United Nations (2015). World Marriage Data.